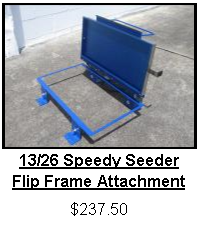 Manufactured by Carolina Greenhouses. 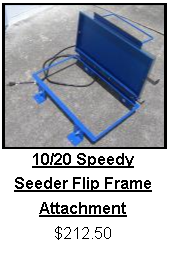 This Speedy Seeder has been designed with the grower in mind, it is user friendly, accurate, reliable and fun to use. 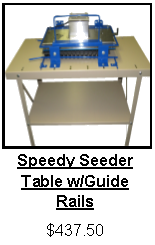 It is constructed of high quality stainless steel and is able to seed a full range of seed types such as pelleted, coated or raw. Sizes are available to accommodate 10/20 or 13/26 flats. 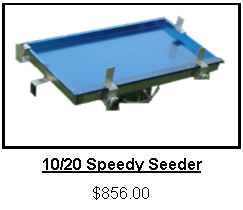 The Speedy Seeder has no vacuum hoses to fight with and the extra seed stay on the plate because of our special seed channel. 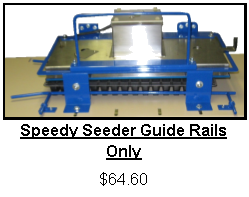 This seed channel attached to the plate holds excess seed which enables you to seed flats faster and more continuous before adding more seed.